Interstate 393 is a spur freeway taking traffic from Interstate 93 and the state capital of Concord to points east along U.S. 4 and 202. These two routes continue to Portsmouth and Rochester, respectively. The freeway bypasses Concord Municipal Airport (CON) and the commercialized corridor of NH 9 (former U.S. 4 & 202) to the north. A previous reassurance sign posted east of U.S. 3. U.S. 4 combines with Interstate 393 from I-93 south. The sign was removed by 2005. Photo taken by Dan Moraseski (10/00). Interstate 393 & U.S. 4-202 leave the diamond interchange (Exit 3) with NH 106 (Sheep Davis Road) and approach the merge onto NH 9 (Dover Road) eastbound. Photo taken 06/27/05. A reassurance guide sign omits Interstate 393 at the Soucook River crossing. U.S. 4 east & 202 north continue another 16.5 miles along Dover Road to their split at Northwood. Photo taken 06/27/05. The final Interstate 393 ITS milepost stands along the freeway at the wye interchange with New Hampshire 9 (Dover Road). Photo taken 06/27/05. U.S. 4-202 & NH 9 east continues six miles east from I-393 to NH 28 near Gossville. NH9 follows U.S. 202 beyond Northwood to Barrington and Dover. Like many New England Routes, NH 9 is part of a longer multi-state route in both Maine and Vermont. Photo taken 06/27/05. U.S. 4/202 and NH 9 (Dover Road) split at Interstate 393 and the Chichester and Pembroke town line. I-393 provides a direct connection with the Concord area Interstates while NH 9 shifts onto parallel Loudon Road. Photo taken 06/27/05. Interstate 393 & U.S. 4-202 separate from NH 9 west at a wye interchange. Interstate 393 & U.S. 4-202 overlap west to I-93. NH 9 turns southwest toward Steeplegate Mall and Concord Municipal Airport (CON). Photo taken 06/27/05. Photo taken by Jeff Royston (12/02). I-393 and NH 9 (Loudon Road) intertwine west to repective junctions with NH 106 (Sheep Davis Road). NH 9 continues to the Concord Heights Business District. I-393 west to I-93 south or U.S. 3 (Main Street South) leads motorists toward Downtown Concord. Photo taken 06/27/05. NHDOT uses small guide signs in place of stand-alone shields as reassurance markers on most freeways and surface highways. Pictured here is the first Interstate 393 marker posted after the split with NH 9 (Loudon Road). Photo taken by Jeff Royston (12/02). Interstate 393 & U.S. 202 west split with U.S. 4 west at the northbound on-ramp to I-93. U.S. 4 overlaps with I-93 northward 5.5 miles to Exit 17 and Andover. Photo taken 06/27/05. An unnumbered loop ramp follows from I-393 & U.S. 202 west for Interstate 93 south toward Manchaster. I-93 runs 3.5 miles south to the exchange with I-89 north to Lebanon. Photo taken 06/27/05. RIRO (right in right out) ramps connect the west end of the I-393/U.S. 202 freeway with Commercial Street. Commercial Street links both sides of the freeway with Constitution Avenue to the east and a nearby business park. Photo taken 06/27/05. Interstate 393 & U.S. 202 pass over an abandoned railroad line ahead of the at-grade intersection with U.S. 3 (North Main Street). U.S. 202 combines with U.S. 3 south for a 0.7 mile overlap through Downtown Concord. U.S. 3 north heads toward the Penacook section of the city. Photo taken 06/27/05. U.S. 3 & 202 (North Main Street) intersects Washington Street just ahead of their split at I-393 in Concord. Photo taken 06/27/05. U.S. 3 northbound continues along North State Street to Penacook in north Concord and Boscawen (U.S. 4). 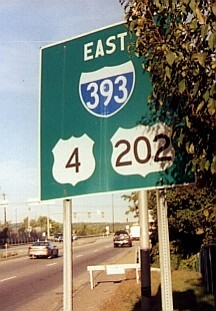 I-393 & U.S. 202 provide a direct connection to I-93 and U.S. 4 o the immediate east. Photo taken 06/27/05. U.S. 202 leaves U.S. 3 northbound via the Interstate 393 freeway east for Chichester and Rochester. Photo taken 06/27/05. Commercial Street ties into the eastbound lanes of I-393/U.S. 202 at a RIRO (right in right out) intersection preceding the cloverleaf interchange with Interstate 93 and U.S. 4 west. Photo taken 06/27/05. The exit to Interstate 93 southbound toward Manchester, and Boston departs I-393 & U.S. 202 east. The ramp also connects with Stickney Avenue southbound. I-93 travels 3.5 miles south to I-89 and the F.E. Everett Turnpike. Photo taken 06/27/05. Continuing over I-93, I-393 & U.S. 202 reach the loop ramp for I-93 north & U.S. 4 west. The two routes overlap 5.6 miles north oto the town of Canterbury. U.S. 4 branches west from there to Boscawen while I-93 travels 41 miles north to Plymouth. Photo taken 06/27/05. Interstate 93 advances north through the diamond interchange (Exit 14) with NH 9 to I-393 & U.S. 4-202 (Exit 15). Interstate 393 comprises a spur west to U.S. 3 (North Main Street) and east along side U.S. 4/202 to the town of Chichester. Photo taken 06/27/05. Exit 15E departs Interstate 93 northbound for the I-393 & U.S. 4/202 east to Loudon and Chichester. U.S. 4 and U.S. 202 join Concord with Portsmouth and Rochester respectively. Photo taken 06/27/05. The previous set of overheads posted on Interstate 93 northbound at Exit 14. U.S. 202 west combines with U.S. 3 (North Main Street) south from the I-393 Connector. Photo taken by Douglas Kerr (09/30/01). Merging onto Interstate 93 south & U.S. 4 east from Portsmouth Street (Exit 16) north of Concord. The freeway proceeds south one mile from the Portsmouth Street to Interstate 393 & U.S. 202 at Exit 15. Photo taken 06/27/05. Exit 15W leaves Interstate 93 south & U.S. 4 east for the I-393 Connector and U.S. 202 west to U.S. 3 (Main Street) north of Downtown Concord. Photo taken 06/27/05. U.S. 4 parts ways with Interstate 93 southbound and combines with I-393 & U.S. 202 east at Exit 15E. The three routes continue east with interchanges for Ft. Eddy Road, NH 132 (East Side Drive), and NH 106 (Sheep Davis Drive). Photo taken 06/27/05. “Briefs about New Hampshire.” The Telegraph, January 4, 1982. “East-west highway study is proposed.” The Telegraph, February 22, 1983. “100th Anniversary Series Part III – The Interstate Highway System.” New Hampshire Highways, May / June 2004 edition. Page updated May 27, 2015.